Pilkington Activ SunShade™ is the latest high performance glazing solution to be added to the ever popular self-cleaning glass range. A dual coated combination glass product, it incorporates the self-cleaning benefits associated with Pilkington Activ™ and the superior solar-control benefits of Pilkington SunShade™ – delivering a self-cleaning, solar control glass product. 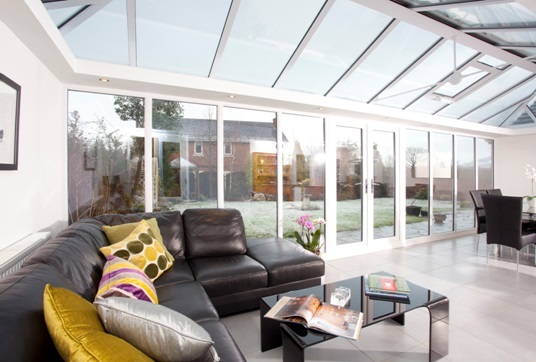 Specially designed for large glazed areas and conservatories, Pilkington Activ SunShade™ is a versatile glass product that provides the ultimate solution for hard to clean areas. An innovative glass product, Pilkington Activ™ self-cleaning glass uses the forces of nature to maintain a cleaner and clearer appearance. In a dual-action process organic dirt is broken down by daylight and is then washed away by rain, thus making it environmentally friendly and very easy to maintain. Another benefit of Pilkington Activ SunShade™ is its superior solar control properties. Available in both Blue and Neutral colours, it works by helping to reduce the amount of direct sunlight that penetrates into a building. Available in 4mm and 6mm thickness, Pilkington Activ SunShade™ can be combined with an inner pane of low-emissivity (low-e) glass from the Pilkington K Glass™ range or Pilkington Optitherm™ range to achieve optimum thermal performance levels in an Insulating Glass Unit (IGU).